410 Driftwood Ct. Forney, TX 75126---Online Only!!! GENERAL TERMS: The auction will be conducted by Rusty by Design Auctions on behalf of the owners of the property, referred to as the Seller. Auctioneer is not responsible for the acts or representations of Seller. The auction shall be governed by the terms set forth herein (the agreement), and any additional terms and conditions that are posted concerning the specific property. The Agreement consitutes a valid, binding contract between individuals participating in the auction with the intent to purchase property, referred to as the Bidder or Buyer, and Seller/Auctioneer. The term Bidder or Buyer shall include, but not limited to, the individual or the company represented by the individual and any and all of its agents, employees, representatives, officers and directors. Auctioneer is not responsible for statements made by the Bidder, Buyer, or other parties. Auctioneer reserves the right to periodically change the terms and conditions of the Agreement, which shall be effective immediately upon posting. It is the Bidders responsibility to review any and all changes made to these terms and conditions prior to bidding on property. The act of submitting a bid shall constitute Bidder acceptance of each and every term and condition contained herein, any additional terms and conditions posted with the property, and any changes made within the full agreement. All persons visiting or inspecting property assume all risks whatsoever of damage or less to person and property and specifically release the Auctioneer from all liability. Auctioneer is not liable by reason of any defect in, or condition of, the property or the premises on which the preview/sale is held. Auctioneer is released for any claims to actual damage to the property sold and/or consequential damages that may result from the sale of defective property.DISCLOSURES/NO WARRANTY: There is no warranty offered, expressed or implied, by Rusty by Design Auctions or Sellers for any property. All property are sold as-is, where-is and with all faults and defects therein. ALL SALES ARE FINAL: All information provided is believed to be correct bu NO warranty as such is either expressed or implied, including but not limited to the merchantability or fitness for a particular purpose. Bidder is solely responsible to determine condition, age, value or any other determinative factor. Bidder inspection of the property prior to submitting a bid is strongly recommended. Auctioneer reserves the right to add or withdraw property from the auction. Auctioneer reserves the right to sell property absolute or with reserve, at Seller's discretion. The Seller does have the right to make the final bid and the Auctioneer does have the right to bid on behalf of the Seller. The auctioneer reserves the right to open the bid as the result of a tie bid or discrepancies in the bid. Buyer assumes full responsibility of property at time of purchase, and all risk of loss and damage to property. All titles will be assigned to buyer. NO OPEN TITLES!Seller also does reserve the right to accept any offer during the auction process and discontinue to bidding process5% earnest money will be due by 5:00 p.m. the day the sale ends. This will be deposited and held in RBD escrow account and will be made available to title company at closing.BIDDER REGISTRATION: Bidder must be 18 years of age or older, and is required to register for the auction. In registration, Bidder must submit information found to be current, complete and accurate for proper identification. Auctioneer does not sell or rent this information. Auctioneer uses email mailing lists to notify customers about online auctions. Bidder is responsible for security of his/her bidding number/user name and password, and any and all bids placed under the assigned number/ID. auctioneer should be notified immediately if Bidder believes number and/or password have been compromised. Auctioneer rserves the right to terminate registration, deny any person for any reason permission or access to bid, to reject any and all bids, and to suspend or ban Bidder from bidding, at Auctioneers sole discretion. Bidder registration is not transferable or assignable.BIDDING: Bidder must register to participate in the auction. Read the descriptions of each property and view photographs carefully. If you have any questions they should be referred to the Broker specified and of record, this will be posted on each real estate auction lot. If you visit the viewing location, please personally inspect the property on which you intend to bid during the date(s) indicated in the details per property. Using YOUR knowledge and experience from your own opinion of the property and bid accordingly. If you are in doubt, DO NOT BID. All properties are sold AS-IS, this is an AUCTION and all SALES ARE FINAL. Bids cannot be retracted and are binding contracts between Bidder and Auctioneer/Seller. Bidder is accountable to be informed about property and associated costs before bidding. A maximum bid can be placed on property. A maximum bid is kept confidential, and Bidder authorizes Auctioneer's website Hi-Bid to place bids on his/her behalf up to the amount of the maximum bid. Upon sale of property, identifying information and purchase amount will be posted for a designated period of time. All questions or disputes must be resolved immediately; no changes or adjustments will be made at a later date. Auctioneer reserves the right to reopen bidding, Auctioneer decisions will be final.BUYER'S PREMIUM: A Buyer's premium will be charged on each purchase. A buyer's premium, an advertised percentage of the high bid or flat fee added to the high bid will be added to the high bid and become part of the purchase amount at settlement. Buyer agrees to these provisions and will pay the applicable buyer's premium.REAL ESTATE SPECIFIC TERM:If you are participating in a real estate auction, the following additional terms will apply to the Auction Terms and Conditions set forth above. PAYMENT TERMS: A down payment of five percent (5%) of the contract price must be made as down payment immediately following the auction and will be handled with the real estate broker of record or designated title company.. Personal checks, business checks, cashier's checks, money orders and cash are accepted wityh proper identification and the balance is due at closing within thirty (30) days from the date of the auction unless otherwise agreed upon at time of contract.A 10% Buyer's Premium ($2500 minimum) will be added to the high bid to calculate the purchase price. You will also be responsible for all closing costs. PROPERTY INFORMATION: The Bidder should inform themselves about the property they seek to purchase by reviewing the photographs, relevant maps, location of the property, surveys, taxes, title reports, easement and restrictions and all relevant seller disclosures as well as the posted Earnest Money Contract. CONTRACTUAL OBLIGATIONS: By participating as a Bidder at a real estate auction, the High Bidder agrees to execute the posted Earnest Money Contract and immediately be prepared to pay the required deposit and satisfy other terms that are required. You should review the Earnest Money Contract with your attorney prior to bidding on real estate. You will be contacted by broker of record immediately after winning to arrange for Earnest Money Contract and deposit to take place within 24 hours of winning bid. NOTE: Regarding properties that do not meet minimum reserve, Seller reserves the right to accept highest bid offered within 72 hours of closing of auction bidding. Please be advised, that you highest bid is realized as a good faith offer to purchase should seller choose to accept it. EFFECT OF SIGNING BIDDER AGREEMENT: By signing the bidder agreement, the Bidder agrees to be bound by the terms and conditions of the auction as well as the Earnest Money Contract for the specific property being auctioned. Each Earnest Money Contract provides the specific terms for contracting for the purchase of real estate and Bidder agrees to be bound by said terms. AUCTION INFORMATION: You can keep advised of the auction date, time and place by going to rustybydesignauction.com. The website should provide you general information about the property, its location, date and time of auction and other pertinent information. Since the scheduling of auctions is subject to change, you should verify the auction date and time immediately prior to attending the auction.ONLINE BIDDING INFORMATIONIf you are participating in an online auction, the following additional terms will apply to the Auction Terms & Conditions set forth above:OBTAINING A USER NAME & PASSWORD: Click on LOGIN/NEW BIDDER on our Home Page. Follow the instructions. If you need assistance feel free to contact Rusty by Design Auctions at 214-531-6575.BIDDING IN THE ONLINE AUCTION: Once you are registered and have your User Name & Password, you may place bids as soon as a lot opens for bidding. Your bids are FINAL and constitute a binding contract.Sebae Data Solutions, Inc.SERVICE TERMS AND CONDITIONSACCEPTANCE OF TERMSSebae Data Solutions, (the makers of Auction Flex & HiBid (formerly Bidopia) hereafter referred to as "Sebae"), provides its service to you, subject to the following Terms & Conditions ("TAC"), which we may update from time to time without notice to you. The most current version of the TAC can be found found at any time by visiting the link: http://www.auctionflex.com/showtandc.apUSE AND REGISTRATIONOur services are available only to, and may only be used by individuals who can form legally binding contracts under applicable law. Without limiting the foregoing, our services are not available to children (persons under the age of 18) or to temporarily or indefinitely suspended members. If you are under the age of 18, you can use this service only in conjunction with, and under the supervision of your parents or guardians. If you do not qualify, please do not use our service. If you are registering as a business entity, you represent that you have the authority to bind the entity to the TAC.REGISTRATION OBLIGATIONSIn consideration of your use of the Service, you agree to: (a) provide true, accurate, current and complete information about yourself as prompted by the Service's registration form (such information being the "Bidder Information") and (b) maintain and promptly update the Registration Data to keep it true, accurate, current and complete. If you provide any information that is untrue, inaccurate, not current or incomplete, or Sebae has reasonable grounds to suspect that such information is untrue, inaccurate, not current or incomplete, Sebae has the right to suspend or terminate your account and refuse any and all current or future use of the Service (or any portion thereof). DESCRIPTIONS OF SERVICESebae provides the following services under the Auction Flex & HiBid trademarks: Integrated Web Service (for auctioneers), internet bidding (absentee, online-only, & webcast). You can learn more about these services in the following sections.HIBID INTERNET AUCTION PLATFORM & WEB SERVICE DESCRIPTIONSebae provides the HiBid (formerly Bidopia) Internet Auction Platform & Web Service ("HWS") under the HiBid trademark as a software solution for auctioneers wishing to extend the audience of their live auctions to the internet. The HWS provides various features including internet absentee bidding, internet-only auctions, and webcast auctions. The HWS is able to changes its appearance to coincide with the website that it is powering. Accordingly, the HWS powers the www.hibid.com website as well as numerous Auction Flex customer websites. This ability to change appearance is a feature of the HWS. Much like internet merchant account providers can host a secure web page for a vendor to easily process payments, the HWS hosts certain portions of the auctioneer's website to easily enable advanced features such as internet bidding. INTERNET-ONLY AUCTIONSInternet only bidding allows you to place a bid for an item prior to the auction lot closing online. In an internet-only auction there is no live auction. BIDDINGThe Service requires you to login with your username and password prior to placing a bid on a Lot. Making bids with false information or with stolen credit card information is prohibited and illegal.Your user name and password are required in order to place internet bids. Making bids in a false name or with an invalid or stolen credit card is prohibited. Each bid carries the computer coding of the Internet provider which allows the individual user to be traced and Sebae may at its discretion release this information to enable legal action to be taken. Sebae may, in its entire discretion, refuse or remove bids where it suspects that bids contravene this prohibition. By placing a bid, you are making a binding and irrevocable offer to purchase the Item at any price up to the maximum bid amount you submit. If you win, you must complete the transaction, subject to any contractual right or other right at law to rescind the contract in certain circumstances. Failure to complete transaction without lawful reason is not only a breach of your contract with the Seller but also a breach of this User Agreement.The amount bid can be increased but cannot be decreased. The auctioneer may, at their discretion, allow you to withdraw and resubmit a bid in the case of bids containing an obvious typographical error. You may forward a request to withdraw a bid and resubmit a correct bid by immediately sending an email to the auctioneer, however, there is no guarantee that any bid will be withdrawn. Although Sebae will use best efforts to forward all bids, Sebae does not accept any responsibility for lost bids or problems with the recipient auctioneer's ability to process your bid. 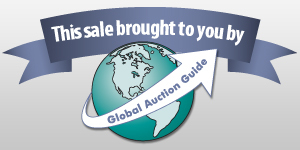 Moreover, Sebae cannot guarantee that bids received will be processed by the individual auctioneers.Please note that Sebae's role is limited to the provision of the Site for dissemination and publication of information provided by the Sellers.THE WINNING BIDThe winning bid in an auction will be the highest bid that exceeds any reserve (if a reserve exists). In the case of equal bids, the earliest bid received will be the winning bid. If a higher bid is subsequently withdrawn or removed then the auctioneer shall have the right to accept the next highest bid.COPYRIGHTAll material and content as provided by the Service is protected by copyright and similar rights. You can not use or make available any of that material for any commercial purpose.SPECIAL ADMONITIONS FOR INTERNATIONAL USERecognizing the global nature of the Internet, you agree to comply with all local rules regarding online conduct and acceptable content. Specifically, you agree to comply with all applicable laws regarding the transmission of technical data exported from the United States or the country in which you reside.DISCLAIMER OF WARRANTIESYou expressly understand and agree that:a. Your use of the service is at your sole risk. The service is provided on an "as is" and "as available" basis. Sebae expressly disclaims all warranties of any kind, whether express or implied, including, but not limited to the implied warranties of merchantability, fitness for a particular purpose and non-infringement.b. Sebae makes no warranty that (i) the service will meet your requirements, (ii) the service will be uninterrupted, timely, secure, or error-free, (iii) the results that may be obtained from the use of the service will be accurate or reliable, (iv) the quality of any products, services, information, or other material purchased or obtained by you through the service will meet your expectations, and (v) any errors in the software will be corrected.c. Any material downloaded or otherwise obtained through the use of the service is done at your own discretion and risk and that you will be solely responsible for any damage to your computer system or loss of data that results from the download of any such material.d. no advice or information, whether oral or written, obtained by you from Sebae or through or from the service shall create any warranty not expressly state in the TAC.LIMITATION OF LIABILITYYou expressly understand and agree that Sebae shall not be liable for any direct, indirect, incidental, special, consequential or exemplary damages, including but not limited to, damages for loss of profits, goodwill, use, data or other intangible losses (even if Sebae has been advised of the possibility of such damages), resulting from: (i) the use or the inability to use the service; (ii) the cost of procurement of substitute goods and services resulting from any goods, data, information or services purchased or obtained or messages received or transactions entered into through or from the service; (iii) unauthorized access to or alteration of your transmissions or data; (iv) statements or conduct of any third party on the service; or (v) any other matter relating to the service.EXCLUSIONS AND LIMITATIONSSome jurisdictions do not allow the exclusion of certain warranties or the limitation or exclusion of liability for incidental or consequential damages. Accordingly, some of the above limitations of of the previous two sections titled 'Disclaimer of Warranties' and 'Limitation of Liability' may not apply to you.INDEMNITYYou agree to indemnify and hold Sebae harmless from any claim or demand, including reasonable attorneys' fees, made by any third party due to or arising out of your breach of this Agreement or the documents it incorporates by reference, or your violation of any law or the rights of a third party.LEGAL COMPLIANCEYou shall comply with all applicable domestic and international laws, statutes, ordinances and regulations regarding your use of our service and your bidding on, listing, purchase, solicitation of offers to purchase, and sale of items.GENERAL INFORMATIONThe TAC constitute the entire agreement between you and Sebae and govern your use of the Service, superseding any prior agreements between you and Sebae. The TAC and the relationship between you and Sebae shall be governed by the laws of the State of Florida without regard to its conflict of law provisions. You and Sebae agree to submit to the personal and exclusive jurisdiction of the courts located within the county of Marion, Florida. The failure of Sebae to exercise or enforce any right or provision of the TAC shall not constitute a waiver of such right or provision. If any provision of the TAC is found by a court of competent jurisdiction to be invalid, the parties nevertheless agree that the court should endeavor to give effect to the parties' intentions as reflected in the provision, and the other provisions of the TAC remain in full force and effect. You agree that regardless of any statute or law to the contrary, any claim or cause of action arising out of or related to use of the Service or the TAC must be filed within one (1) year after such claim or cause of action arose or be forever barred. Announcement:Information contained herein is presented on behalf of the seller. Rusty by Design, agent for the seller, cannot guarantee the information to be correct or assume the liabilities for errors and omissions. All lines drawn on maps are approximate. Buyers should verify the information to their own satisfaction. Any announcements made from the auction block on day of auction will take precedence over any matter of print and will be final.